Designed for Chevy 396-502 street applications with large oval port cylinder heads (1975-Earlier)or Pefromer/RPM heads, the RPM Air-Gap incorporates the same race-winning technology that's been used on the Victor Series competition intakes for years. Includes rear water outlets, two distributor clamp locations, and nitrous bosses. Accepts all late-model alternator and A/C brackets for the street. For square-bore carburetors only. No provision for exhaust-heated chokes and no exhaust crossover. Will not fit under stock hood of Corvette, 1965-67 Chevelle, or 1970-81 Camaro. Port Exit Dimensions: 1.60" x 1.94"
Manifold Height: (A) 4.30", (B) 6.00"
Edelbrock has brought race-inspired technology to the street, again! The RPM Air-Gap is a dual-plane intake manifold with a dropped plenum divider that separates the intake runners from hot engine oil in the lifter valley. This provides a cooler, denser air/fuel charge for more power. 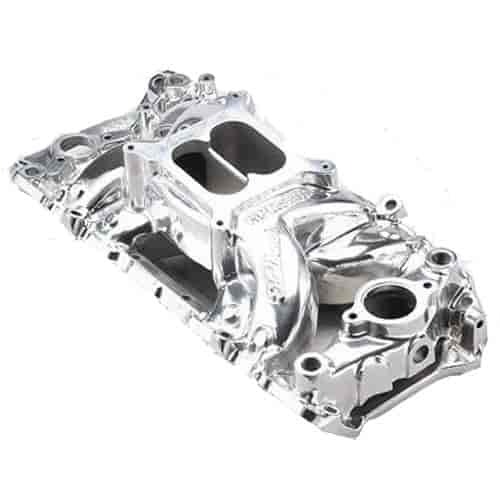 Does Edelbrock 75611 fit your vehicle?